Lexus RX crossovers are many. 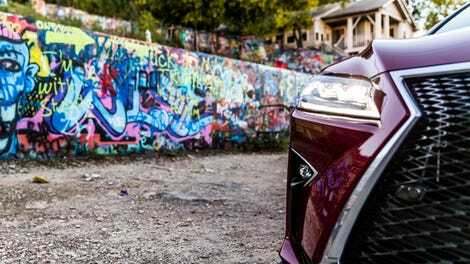 Lexus RX crossovers are legion. You can run, but you can’t hide. Because you will see 12 of them crammed in a 10-spot parking lot, we had to see if the latest one was any good. However, it was weirdly disappointing, and not just because it’s a crossover. After driving one for a week I kind of feel like Lexus has this game figured out and it’s just resting on its laurels now. I almost shouldn’t even have to introduce the Lexus RX at all. Ever since the egg-shaped original one from the late 1990s, it’s about the most ubiquitous luxury crossover of them all. Comfortable, bland, reliable, nice, anonymous. A huge sales success for being an easy choice. In fact, this and the original Mercedes M-Class are arguably the original modern luxury crossovers. But one thing it’s not known for is driving dynamics or dramatic styling. The latter has changed lately; the former, well, not so much. For 2017, the Lexus RX 350 F Sport is a mildly upgraded version of the regular RX 350, powered by the same 3.5-liter V6 engine good for 295 horsepower and 268 lb-ft of torque. 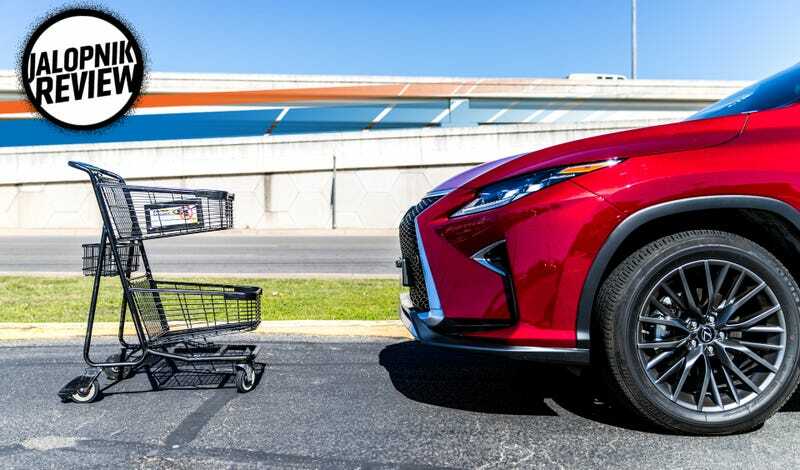 It’s just a smidge less powerful than the hybrid V6 RX 450h model, but it gets the job done for moving this 4,222-pound (curb weight) car smoothly and without drama. You can also get the RX in all-wheel-drive, but the one we tested had an eight-speed automatic transmission sending all the power to the front wheels only. Functionally, it is a large, tall car. It’s only rated to tow 3,500 lbs. There are no trick features to take it off-road, although its ground clearance will forgive running over mild bumps and parking it like a bro. It exists to be a taller car. It may be designed for mall crawling, but the ground clearance isn’t bad. Also, Lexus buyers may park like this unintentionally. We all know this car from someone, somewhere. It’s the prototypical champagne Lexus crossover that everyone’s mom, dad, aunt, uncle and even sorority big (and probably little, too) had at one point in time. They sell like hotcakes. The RX series accounted for 34.5 percent of Lexus’ 2017 sales as of September 2017, outselling every other Lexus model by a long shot. Because this is Lexus’ bread and butter vehicle, it’s the car that allows them to build the cool, lower-volume stuff that we adore. GT3 race cars. V10 supercars. Futuristic burnout machines. Stuff that would have no funding to exist if Lexus didn’t sell the crap out of something on the road. In general, we like Lexus at Jalopnik lately, because they’ve been trying, with fun stuff like the F models and the LC Coupe and attempts at being visually interesting—even if it’s not to everyone’s tastes. Problem is, I just can’t see any other reason to buy the RX 350 unless you’re a Lexus stan for life. The RX 350 does have a pretty smooth engine and transmission combination, but it’s still just not a very pleasant or enjoyable car to drive, regardless of whether you’re trying to drive fast or not. The big V6 glides smoothly up to freeway speeds without much drama—but then you hit a bump in the road or have to turn and it all sort of unravels. The floating roof: everybody’s doing it. After driving the driver-centric 2019 Porsche Cayenne last weekend, the RX 350 makes me feel like I took horse tranquilizers. Even the RX’s most aggressive Sport Plus mode (one of four pre-programmed into the car) had less communicative steering than it should for anything with “Sport” in the name, and its pedals had hardly any feedback at all. In fact, the RX’s pedals were so springy and disconnected that it felt as if they were taken from someone’s sweet home PlayStation setup. This front-wheel-drive RX 350 sends all of its 295 horsepower to the front wheels in a hilariously torque-steery manner. Accelerate hard, and it will usually tug the steering wheel to the left a bit. While there’s a certain number of us who think torque steer is hilarious, the Venn diagram of Mazdaspeed 3 fans and Lexus RX owners probably doesn’t have a ton of overlap. Traction control came on in the most innocuous situations as a result to try and keep that under control. There is a button to turn traction control “off” next to the drive mode selector, but it doesn’t turn it entirely off. While I’m sure the target market doesn’t use that button much anyway, maybe Lexus simply knows how it drives. Thankfully in this case, its handling tended towards easy to save understeer. Put driving dynamics aside then, since most RX buyers won’t care. What’s worse is that somehow this car didn’t have a ton of grip in the wet. Perhaps it was the all-season tires it came riding on from the factory, or the way its suspension was set up, but it was constantly breaking traction when it was rainy outside this week. So, I got to see more of that traction control light as the car worked to keep itself in line. The RX 350's ride is also bizarrely springy—the exact opposite of what you’d want in a cushy crossover, or anything with “F Sport” labels all over it. Bumps that should be absorbed by the suspension end up bouncing the car around as it goes down the road. One of my friends who rode in it compared the bounce effect to an old Buick, and he wasn’t wrong. If there’s any one thing that I love about the RX 350, it’s got to be the seats. Holy crap, these are comfortable. Our test car came with heated and ventilated power leather seats with meaty bolsters and as much adjustable lumbar support as you could ever possibly desire. I could nap in these seats, even upright. They’re soft, supportive and nice. The center console has some well-thought out storage areas, too. There’s a false floor in the center console’s big bin to hide stuff underneath. A small bin in front of it (complete with an indentation to pull a USB cord through) is the perfect size for an iPhone 5—small phone fans rejoice—but if all else fails, you can also stash phones and keys underneath the HVAC controls, or inside the big console bin. And of course, there are cupholders in the center console as well as the doors. Lexus knows how this car gets used. Menus for various car functions that were in front of the driver, and accessible via the steering wheel—radio, driver assists, and other settings—were intuitive and easy to scroll through and use once you got used to them. That’s a life-saver, as using the fiddly center screen while driving is slightly perilous. While I don’t have a ton of experience driving Lexus’ prior RX cars, there had to be some redeeming quality back in the day that drove people here in droves. The current RX is defined more by stuff that just doesn’t make sense. It’s a common complaint whenever we test a Lexus lately, but the fiddly joystick-controlled infotainment screen is among the worst in the business, rattling around the bottom of the list next to, well, Lexus’ pad-based infotainment screen. The joystick is twitchy, and while this one was less twitchy than the stick in the IS 350 I drove earlier this year, it was still dangerously bad. As in, it takes too much attention away from the act of driving to use. While many features are thankfully controlled by real, physical controls on the dashboard and steering wheel, there were some bizarre ones that weren’t. Every other heating and cooling option you could want was a physical button, unless you wanted to turn the air conditioner on or redirect the flow of the air. Then you’ll have to look past the mostly-redundant HVAC controls on the screen and use that awful joystick thing to ping those two items only. It’s not even that great for a short person. The cargo space, while plenty big, sits fairly high in the air with no clever means of getting it back down to earth. Underneath the rear carpet sits a spare tire and bins for storage which are handy but only seem to bump the rear cargo space further in the air. While the rear seats do fold down (although not flat) easily, the rump’s height is no bueno for loading heavy things. Sometimes cars that are meant as basic city transportation at least have the redeeming quality of having good gas mileage, but the RX 350 F Sport did not. Around the city, it hovered around 18 miles per gallon, and only bumped up to 21 MPG when I went out on the open highway some in Eco mode. The Lexus RX 350 F Sport is only rated for a combined 23 MPG (20 MPG city/27 MPG highway). I know it’s hauling around a 4,222-lb vehicle, but that’s pretty meh. I think Lexus has people locked down who are existing Lexus buyers, who love the good customer service they admittedly get from the brand, and/or people who are terrified of the reliability problems they may get from the German brands. That’s fair. You buy this car because it’s a Lexus and therefore probably won’t break down on you. But I didn’t find the RX to be especially competitive in this field. I have trouble getting behind this one. Nearly every other similar luxury crossover I’ve encountered is less confusing to use, more functional or more enjoyable to drive. It starts out more than a base Audi Q5, which comes with all-wheel-drive standard. Our tester was priced into BMW X5 territory, and that Bimmer can actually tow a car on an open trailer. It’s also decent to drive. Or you could get an Acura MDX Sport Hybrid for that much, and have three rows, better gas mileage and, believe it or not, more fun. The list gets even longer if you want to look at even less expensive offerings from Mazda or Volkswagen. If you’re looking at an RX, maybe do yourself a favor and check out the CX-9 and Atlas too. I’m sure some of you are married to the idea of getting another good, reliable Toyota product like all the good, reliable Toyotas you’ve had before it, but I’m sure that’s the reason why this generation RX is so meh. They’re counting on repeat buyers not to shop around or care. I realize that I’m not exactly the target luxury crossover buyer, but I also can’t see any conceivable reason why you wouldn’t buy something else right now. All the other luxury marques are making pretty good crossovers nowadays in response to years of the RX being everywhere, and the RX feels sort of cheap and weird in comparison. It’d be a shame to see Lexus falling behind the competition, because I like crazy Japanese V10s and race cars. Please, fix the RX. Or at least give people a reason to keep buying them beyond habit. It gets the job done, but key features are irritating or hard to use. All the torque steer of an FWD Mini, none of the fun.